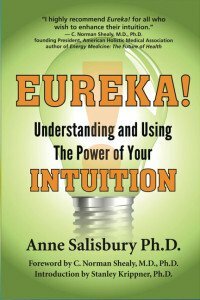 Everything you need to know about intuition, but didn’t know to ask is revealed in Dr. Anne Salisbury’s ground-breaking book, Eureka! Understanding and Using the Power of Your Intuition. Eureka! is the complete resource for tapping into your intuition and improving your personal and work life. The Eureka System™ delivers an easy 7-step process that helps you increase your intuitive abilities and make the right decisions quickly. Intuition is as old as mankind, as modern as today’s headlines and as natural as breathing. Everyone has had an “aha” moment in their lives. Few of us realize that we can hone those unique experiences by tapping into the source—our intuition. The result is that workplace and personal success is achieved. Can you access intuition on demand? Should you trust your intuition? Does intuition play a role with logical thinking? How can you use intuition in any type of decision making? Part 1 grounds the reader with definitions. It opens the doors to some of the great thinkers of our time – discover how they use intuition. Part 2 describes the various characteristics of successful intuiters. How can intuition be applied at home and work? What factors actually inhibit your intuition? Part 3 introduces the unique 7-step Eureka System.™ This exposes the secret of how to access your intuition fully. Part 4 ties it all together and gives you the tools and techniques for accessing intuition. Anne Salisbury, PhD (psychology), MA, MBA is a sought-after speaker, trainer, consultant and intuitive counselor. She holds advanced degrees in psychology, transpersonal psychology and business. Anne is the founder of the Transpersonal Hypnotherapy Institute and co-founder of Go Intuition, Inc.
Read what others have to say under Testimonials. Order your book signed by the author from this website. Order Eureka! from Amazon.com in book or ebook format.